I worked through some Feedly rearranging today. I definitely need to back up my blog and update my review archive. Thanks for the reminder! Those are two standards for me during bloggiesta. Probably the only time I remember to do them. I thought I left a comment earlier, but maybe not! I just listened to The Life-Changing Magic of Tidying Up and stopped balling up my socks! I think of the author now whenever I put my socks into their overstuffed drawer. Congratulations on working away on your Bloggiesta to-do list! She really sneaks into my everyday life! 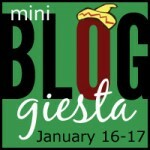 I love the tidying reference :) Happy Bloggiesta! Have a wonderful time and good luck on your list. Your updates look wonderful! So clean and fresh!